Nathan DeWalt was awaiting his deployment to Afghanistan when he was hit by a car on his motorcycle and paralyzed from the waist down, severing his spinal cord. He was in the US Navy, an avid competitor in many Navy Morale, Welfare and Recreation events and hoped to qualify for SEAL training. But instead of lying low after his injury, Nate wouldn’t let himself stay still and forget his passions. 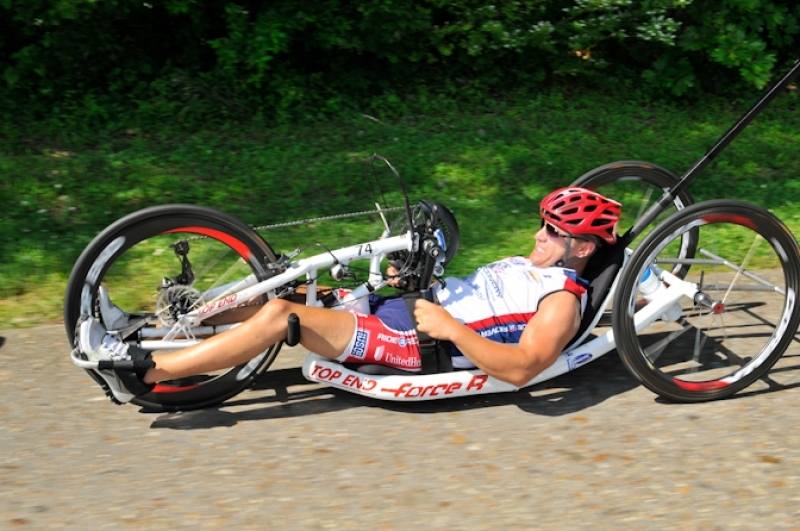 Only six months after his injury, John Wordin, the founder of Ride 2 Recovery, met with him and asked him to join R2R. DeWalt didn’t know anything about the program and had never ridden before, but the prospect of being active and outdoors was irresistible. He learned to ride a handcycle and his life changed. Four years later, DeWalt is now riding regular centuries, is a member of the U.S. Paralympic Triathalon Team and is traveling the world to cycle. He spoke of his recent trip with R2R in Italy and France, where he climbed three of the top ten most famous cycling hills in one week. The climbs included Gavia Pass, Maddalena Pass and Alpe D’Huez. 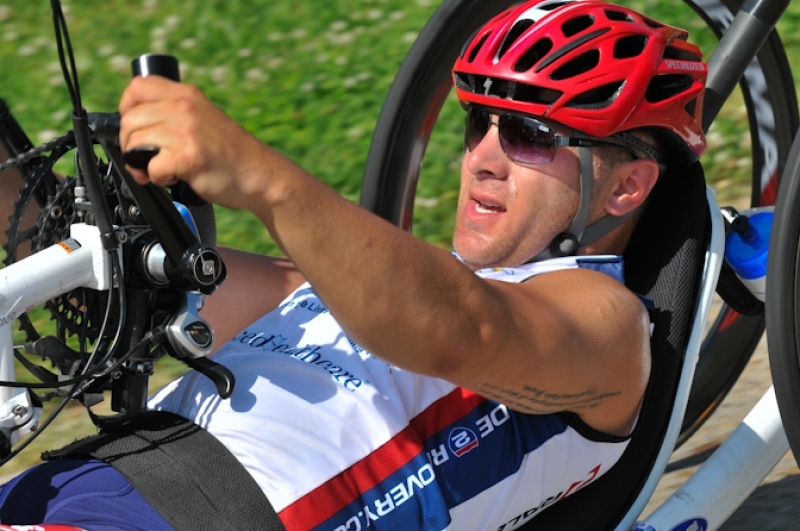 He was pretty sure that he was the first man to ever complete all three on a handcycle. “I try to be a mentor now; I reach out to as many riders as I can at R2R events and find our their stories.” DeWalt gave an example of an old WWII veteran he met while in Germany who he called “Uncle Willy.” He got excited telling of Uncle Willy’s stories about serving with General George Patton. “That’s the best part of all of this,” DeWalt remarked. DeWalt stays incredibly busy; he has a year left before graduating college, is training and traveling with the Paralympic Triathalon Team and is newly engaged. But he always finds time for R2R.